When you select a difference in the top panel, the consequences of the merge of this difference are highlighted in green and red. The consequences highlighted in green are the differences that will be merge with the selected difference. 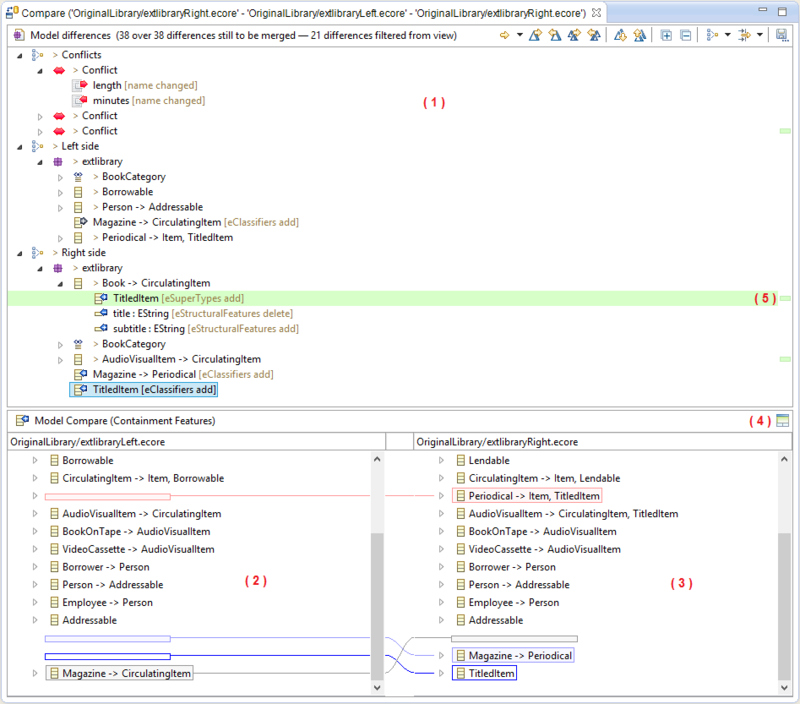 The consequences highlighted in red are the differences that will be not "mergeable" after the merge of the selected difference. A click on a green or red rectangle in the right gutter will lead you to the concerned consequence. The toolbar displays the current status of the comparison and allows you to act on differences. Gives the number of differences still to be merged, and the number of differences filtered from the view. Allows to change the direction of consequences that are highlighted in green and red in the top panel. You can either display the consequences of a merge from left to right or right to left. Allows to expand/collapse all differences in the top panel. Allows to save the comparison model. When you compare models with one in a read-only mode, some of actions proposed by the toolbar are slightly different. Indeed, if you compare a model with the local history, or you compare a model with a remote model stored in a repository (e.g. via EGit), the latter is in a read-only mode. You will not able to merge differences to this read-only model. You will only accept or reject changes for your local model. Allows to change the kind of consequences that are highlighted in green and red in the top panel. You can either display the consequences of accepting/rejecting the selected change. Allows you to accept the single, currently selected change. Allows you to reject the single, currently selected change. Allows you to accept all non conflicting changes at once. Allows you to reject all non conflicting changes at once. If you do a right-click on a difference in the viewer, a contextual menu now offers you to merge the selected difference. These actions are the same than those in the toolbar. represent an addition in the left side model of the comparison. represent a deletion in the left side model of the comparison. represent a change (set/unset/move) in the left side model of the comparison. incoming differences are changes that were made in the right-side/remote model since common ancestor. outgoing differences are changes that were made in the left-side/local model since common ancestor. represent an incoming addition difference. represent an incoming deletion difference. represent an outgoing addition difference. represent an outgoing deletion difference. incoming conflict differences are changes that were made in the right-side/remote model since common ancestor, and are in conflict with the left-side/local model. outgoing conflict differences are changes that were made in the right-side/remote model since common ancestor, and are in conflict with the right-side/remote model. represent an incoming addition conflict. represent an incoming deletion conflict. represent an outgoing addition conflict. represent an outgoing deletion conflict. incoming pseudo conflict differences are changes that were made in the right-side/remote model since common ancestor, and are in pseudo conflict with the left-side/local model. outgoing pseudo conflict differences are changes that were made in the right-side/remote model since common ancestor, and are in pseudo conflict with the right-side/remote model. represent an incoming pseudo conflict addition. represent an incoming pseudo conflict deletion. represent an outgoing pseudo conflict addition. represent an outgoing pseudo conflict deletion. The merged differences are displayed in gray and have a distinct icon. represent a difference that has been merged from right to left. represent a difference that has been merged from left to right. represent a change that has been accepted. represent a change that has been rejected. 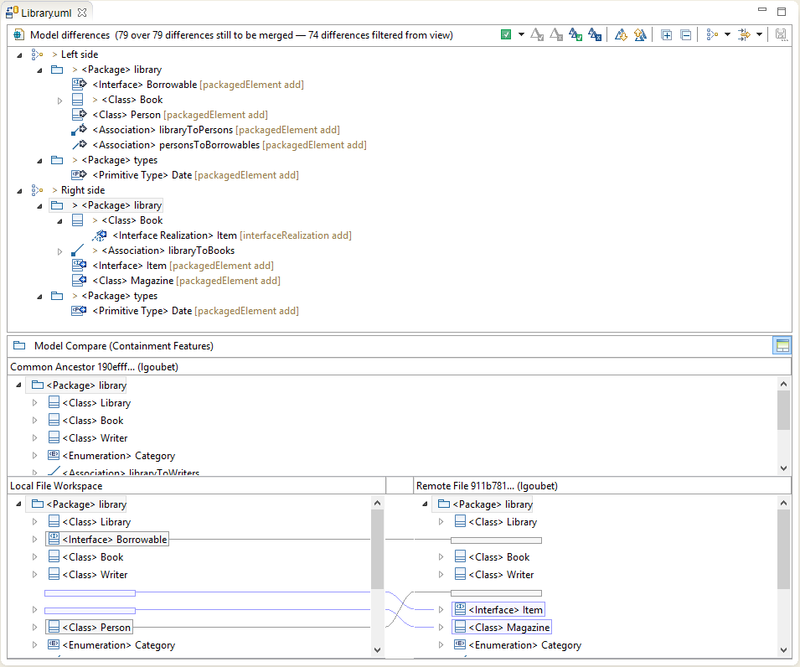 When a model is split into fragments, and only some of them have changes, the structure merge viewer (upper part of the comparison editor) and the content merge viewers (lower parts of the comparison editor) display the models involved in the comparison but don’t display the fragments that have no changes. 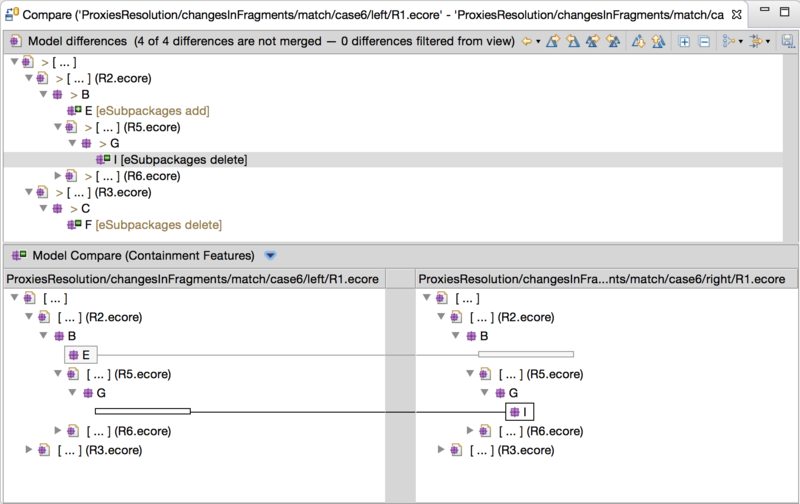 If a change (x) is detected in a fragment (B), and this fragment is a child of another fragment (A) that has no changes, then (A) won't appear in the structure merge viewer (upper part of the comparison editor) and the content merge viewers (lower parts of the comparison editor). As a result, users will think (B) is the root of the global model. To avoid this, the idea is to display intermediate node(s) (represented as [ ... ]) in order to show to users that it exists something (fragments, i.e. a parts of models) between/above the changes. This panel displays all values of the reference outlined in (4) as they are in the right model. In here, we see the location of alias outlined as an empty space. This rectangle is where the new value will be added if we merge it. In this case, it is possible to merge towards the right : the index version of the model is editable, like any other file in the index. If we merge this difference towards the right, then it will exist an unstaged version of the model, and a staged version of the model, that will include the merged difference. But this comparison with index is mainly useful in order to determine exactly what changed in our version. Let's commit our changes on the master branch. Same as previously, you can navigate through the differences via the top panel, the structural view. There are three main kind of elements displayed here. Regular elements, that mimic the containment tree of your input models, are there to separate the various differences and let you know where they were actually detected. Then there are incoming differences, decorated with a blue arrow ( ) or a derived icon, and outgoing differences decorated with a gray arrow ( ) or a derived icon. Incoming differences are changes that were made in the remote branch (here, master) since the branching point (common ancestor). Outgoing differences are changes that were made in the local copy (here, the borrowables branch) since the branching point. The remaining two actions are those that actually interest us here we can either accept all non-conflicting differences to the local copy through or accept them one after the other through . 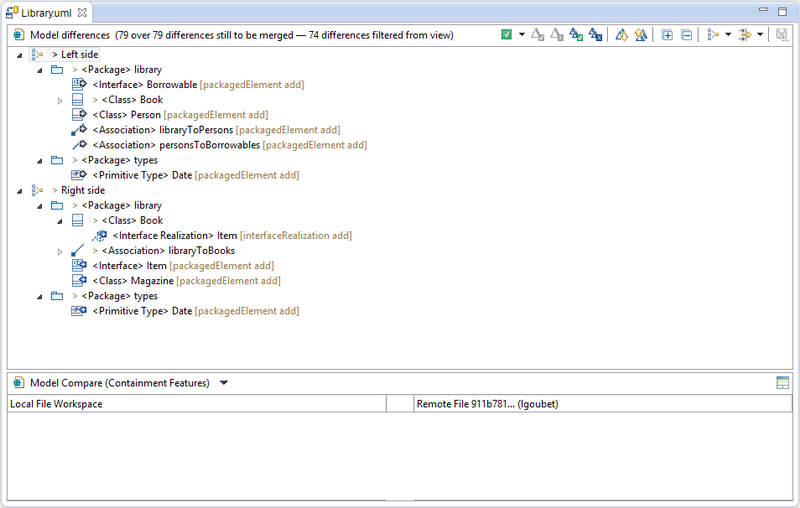 In case of a comparison with remote models, EMF Compare will detect resource name changes. The comparison editor will allows you to accept or reject those changes. Furthermore, in case of a Papyrus diagram & model renaming (renaming all .di, .notation and .uml files), the 3 differences will be accepted or rejected together, in order to maintain the consistency of the models. Group differences by their kind ( additions, deletions, moves, changes). Group differences according to their side: left or right and a special group regrouping differences in conflicts with other differences together. This grouping strategy is display by default in case of a 3-way comparison. Group differences according to their resource: useful when more than two resources involved in comparison and/or resources are split into fragments. New grouping strategies can be provided to EMF Compare through extension points. See Add your own group section in developer guide for further details. 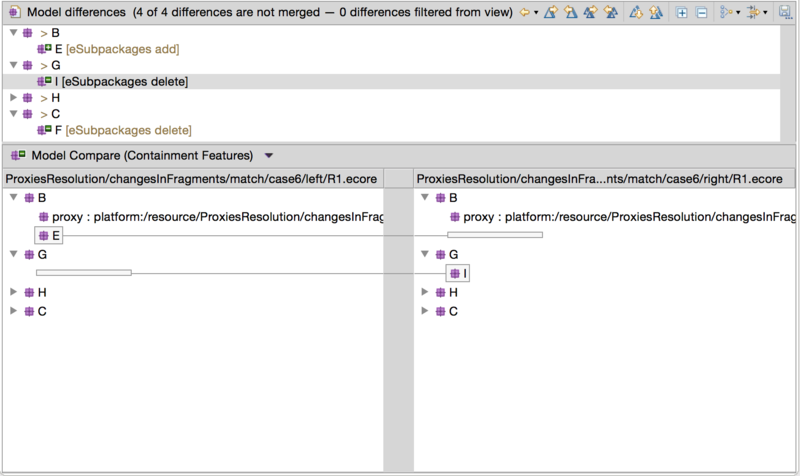 Filter out all resource mappings with no differences from the view. Enabled by default. Filters out differences that apply on EFEatureMapEntry type. Filter out all pseudo conflicts differences (only in case of a 3-way comparison). Enabled by default. Filter out all identical elements (elements with no differences). Enabled by default. Filter out all differences that are contained under differences (except when in conflict). Enabled by default. All settings related to filters are explained in the Filters customization section. New filters can be provided to EMF Compare through extension points. See Add your own filter section in developer guide for further details. 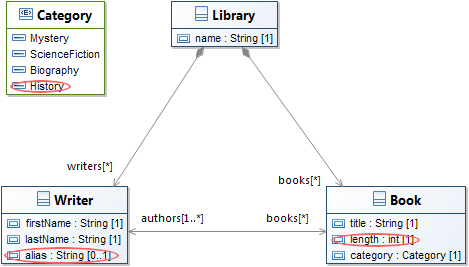 When a 3-way comparison has conflicts, all differences involved in the same conflict are grouped under a Conflict node. In the following case, the Employee Smith has his manager reference in conflict. The left side of the comparison shows that the manager of the Employee Smith is the employee Lennon while the right side side shows that the manager is the Employee Webster. The consequences of a merge from right to left of the selected difference are displayed. When the left side difference Employee Lennon [ manager changed ] is selected in the top panel, the right side difference Employee Webster [ manager changed ] is highlighted in red, that means if the the left side difference Employee Lennon [ manager changed ] is merged from right to left, then it will be impossible to merge the right side difference Employee Webster [ manager changed ] from left to right. After the merge of the left side difference from right to left Employee Lennon [ manager changed ], the right side difference Employee Webster [ manager changed ] is not "mergeable" from left to right anymore, it has been merged from right to left automatically. 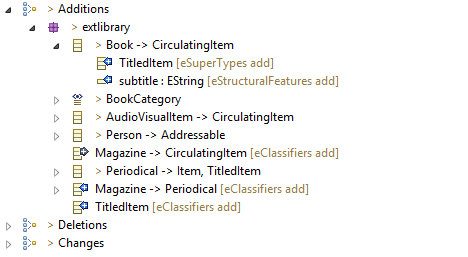 In case of differences made on String-typed attributes, specifics actions are available in the top-right of the content viewer panel. 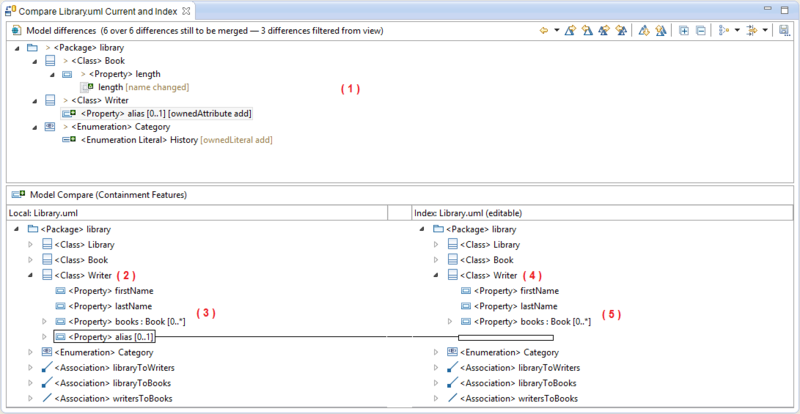 Allows to merge all changes of the current difference. Allows to merge the current change. Allows to move to the next/previous textual difference (in case of multi-valuated String-typed attributes). Allows to move to next/previous change in the current textual difference. On one hand, to focus on the impacted objects, identifying them with markers. These markers are simple transparent rectangles which are set down above the concerned objects and are lightly larger. On the other hand, through phantoms (place-holders), to locate either the place where objects were deleted or the target location where objects should be added after merging. The color of the concerned decorators are highlighted on selection of the difference. 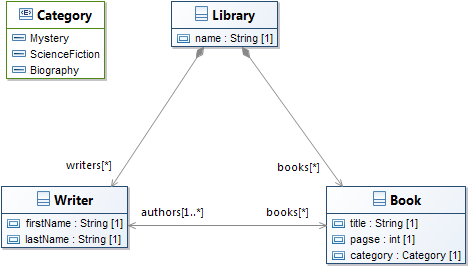 In the following example, a 3-way comparison is run with UML class diagrams. 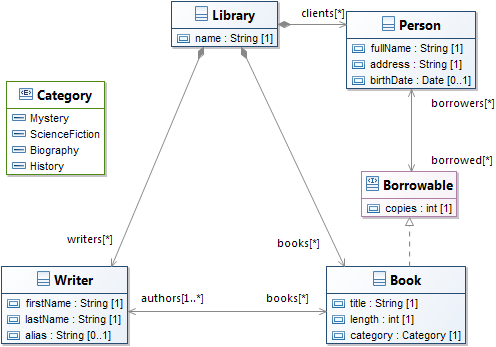 We can see that a Shape associated to a semantic uml class named A has been added on the left side of the comparison. After selected the difference in top panel, we can see the concerned elements in down panels. In the left part, the Shape A is highlighted in gray because it is an incoming change. In the right part, a phantom is drawn at the place the Shape should be after merging from right to left. If they are nested in an other phantom (e.g. due to a delete of the parent object), this last contextual one is displayed at the same time as the main phantom concerned by the current selected change. If they are edges connected to deleted nodes or edges, these last contextual ones are displayed at the same time as the main edge phantom. The color of the contextual phantoms (dependencies) is not highlighted. A simple rectangle for nodes, at the same origin location (and size). A simple line (with the same bend points) for edges, at the same location. A simple line for nodes as element of containment list. For this case, the same LCS computation will be used to locate in the list, at the good index. Particular cases: If the location of the contextual phantoms was changed, the new location of the main phantom is computed. A node place-holder, related to a delete of a node, embedded in a node where the location changed. An edge place-holder between nodes where the location changed. In this case, the display of the line is drawn again. the first capture represent an addition of a lifeline in sequence diagram. the second capture represent an addition of an execution inside the lifeline. We can see the phantom of the execution element, which is highlighted and the phantom of the lifeline parent, which is not highlighted. 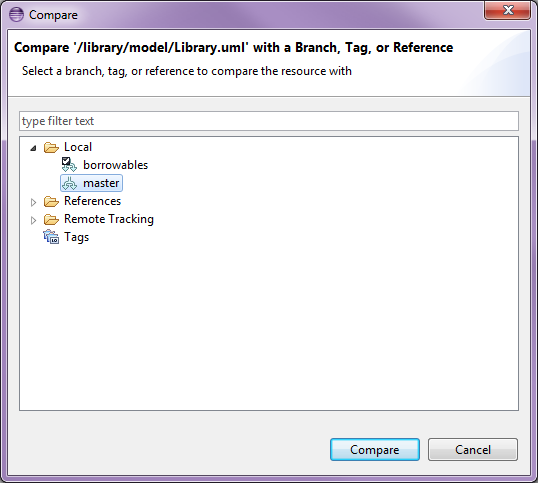 A specific work has been done with EMF Compare for UML. 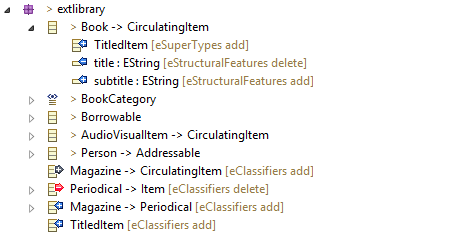 It consists in an additional filter named UML refined elements. 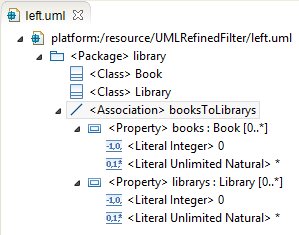 This filter is active by default when a comparison involves UML resources. If EMF Compare detects a change on an element of type association, it will group all changes on the sub-elements of the association to the association difference. The goal of this filter is to ease the merge of differences. Indeed, all you have to do is to merge the association difference and it will merge all the sub-differences with it. EMF Compare offers a way to configure those engines. To customize matching phase go to the "Engines" preference page. Some of the registered Matching engines could be configured. If so, an extra panel will be displayed on the left part of the preference page when the Match engine is selected. The matching strategy of the default match engine can be configured. Basically, you can choose to use either a strategy based on object identifiers or a strategy based on object content or both. Only: Matching strategy based on id only. The match engine will only match two objects together if they have the same identifier. (see Identifiers in Default Match Engine). Never: Matching strategy based on object content. Only the structure of the object will define if two objects can match. When available: This strategy will use both of the above strategies. If an identifier is found on an object then it will use the "Identifier Strategy" if not it will use the "Content strategy". Additional Match Engines can be contributed through EMF Compare's extension point (see Override Match Engine). They can be enabled or disabled from the preference page. On this page you will find all registered match engines. They are ordered by priority (highest priority on top of the list). To enable an engine, check it. Uncheck the engine to disabled it. The first enabled Match engine that handles the comparison will be used. To customize one of the other phase, go to the "Engines" preference page. Open the tab corresponding to the phase to customize. On this tab you can select which engine will be used by the comparison process. To do so, check the engine you want to define as default. Result of each phase of the comparison process (see Comparison process) can be refined thanks to post processors. To customize those post-processors go to the related preference page. On this page you will find all registered post processors. They have been sorted by ordinal (top element of the list will be executed first). 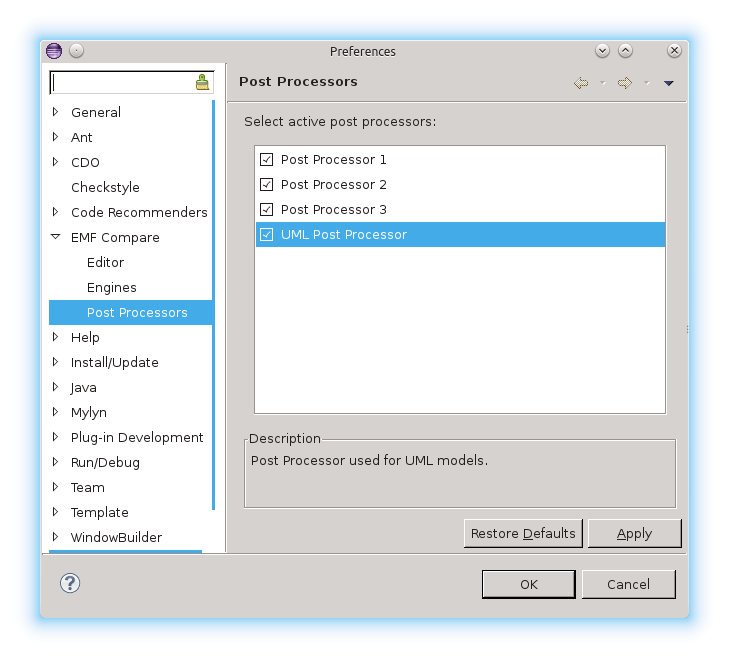 To enable or disable any post processor simply check or uncheck each of them. Unchecked post processors will not be triggered during later comparisons. For each comparison, EMF Compare needs to define which resources are about to be compared. This scope is called the logical model (see Logical Model). Model resolvers are used to define strategies to build this logical model. The model resolvers will try and find cross referenced resources starting from the compared one in order to determine the logical model that needs to be compared along with it. This can be used to widen or reduce the scope in which EMF Compare will seek these linked resources. 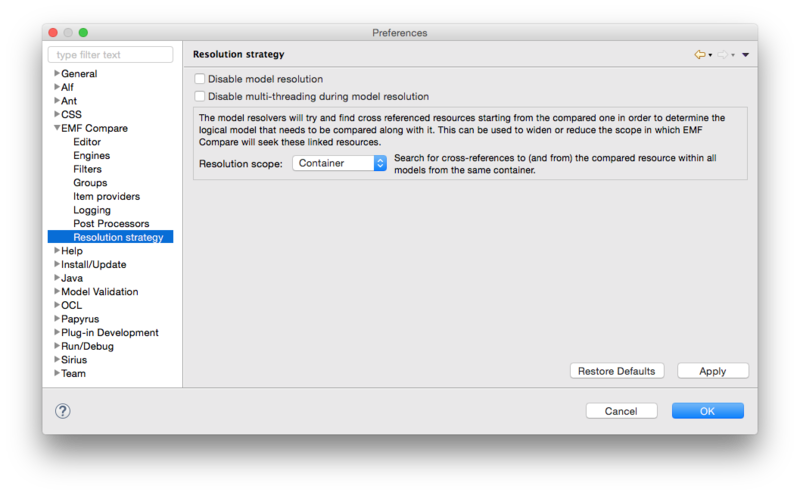 To customize the model resolution behavior go to the "Resolution strategy" preference page. Workspace: Search for cross-references to (and from) the compared resource within all models from the workspace. This strategy is highly recommended in case of a comparison with remote models (EGit). 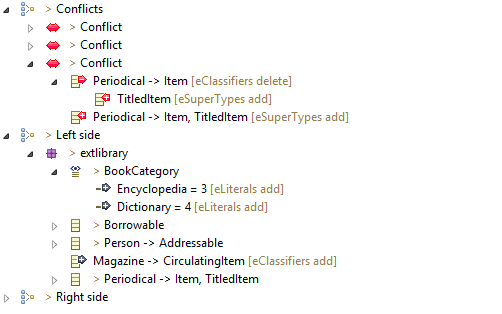 Project: Search for cross-references to (and from) the compared resource within all models from its containing project. Container: Search for cross-references to (and from) the compared resource within all models from the same container. Outgoing: Only search for cross-references from the compared resource to its children (and recursively). Other external strategies might be contributed to EMF Compare. In that case it may happen that the selected strategy can not handle a comparison. If it is so, EMF Compare will use the default strategy. EMF Compare can prevent building the logical model. In that case, it will only compare the selected resources. To disable model resolution, check the button called "Disable model resolution". 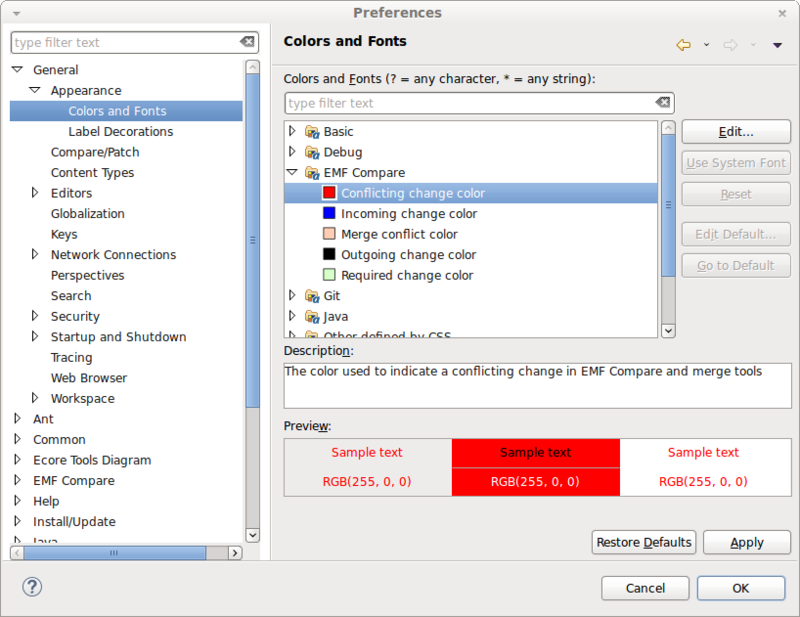 You can customize the colors used by EMF Compare to highlight differences in the user interface. Open the EMF Compare Category. Select the color you want to customize and click and edit to pick a new color. Your editor will now use your new colors. You have already been explained how to use filters to hide or display differences in EMF Compare UI (see Toolbar). This chapter teaches you how to customize filter default activation. The first panel (1) is used to define which filters should be activated by default. Checked elements will be activated for later comparisons. Of course, only filters that can handle the comparison will be activated (for further explanations see Add you own filter). Always: Each time you will modify the filters selection in UI, the selected set of filters will be synchronized with the preferences. This way the filters that you have selected will be kept between comparisons. 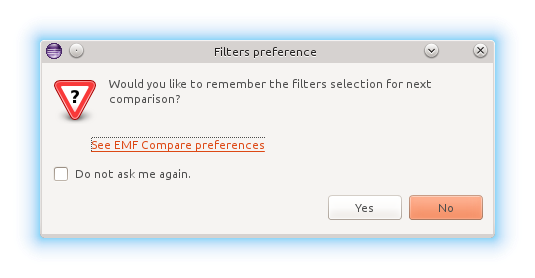 Never: The selection of filters in UI will never be synchronized with the preferences. 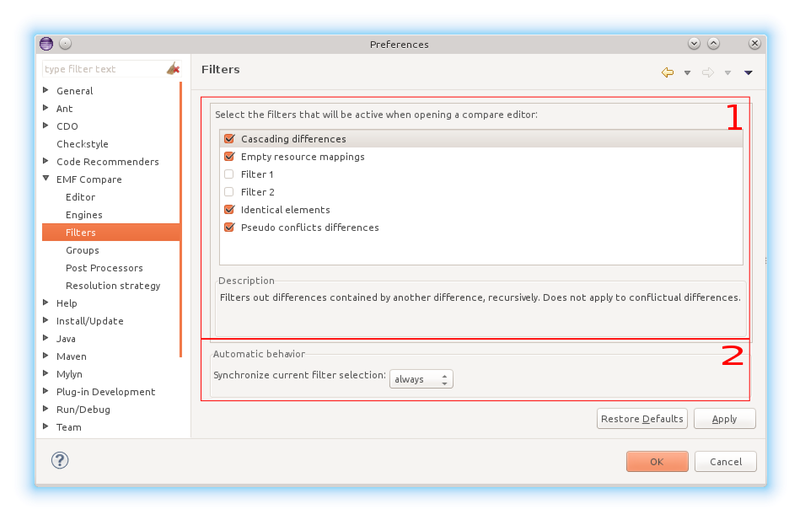 If your answer is "Yes", the current set of selected filters will be synchronized with the preferences. In other word, it will become your default activated set of filters. If your answer is "No", nothing will be synchronized. Next time you will launch a comparison, the activated filters will be defined by the preferences. If you check "Do not ask me again", the above behaviors will be executed and the synchronization behavior will change. It will be set to "Always" if you have selected "Yes". It will be set to "Never" if you have selected "No". You have already been explained how to use groups to gather differences in EMF Compare UI (see Toolbar). This chapter teaches you how to customize the default activated group in EMF Compare. The top panel (1) is used to define the default group. EMF Compare uses an ordered list of groups to determine which group should be the default one. The first group in this list that can handle the comparison is chosen as default group. To change it, simply put the desired group in top of the list. To do so, use the up and down buttons located on the right side of the panel. Always: Each time you will select a group in UI, it will become the default group. Never: The selection of a group in UI will never modify the default group. If your answer is "Yes", the current group will be synchronized with the preferences. In other word, it will become the default group. If your answer is "No", nothing will be synchronized. 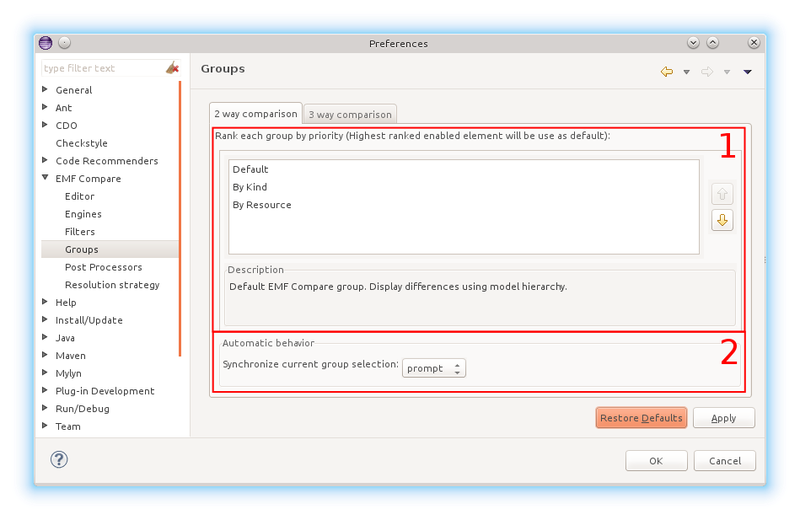 Next time you will start a comparison, the default group will be defined by the preferences. 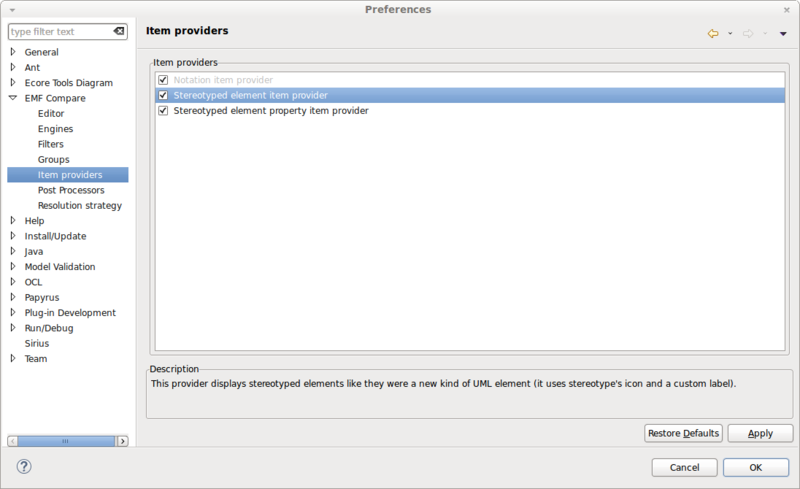 In EMF item providers are used to define how elements are displayed (label, icon etc..). They belong to the EMF.Edit framework. Item providers are generally contributed to EMF however it can happen that some of them are directly contributed to EMF Compare. In general, it's done if you want to customize the way elements are displayed in EMF Compare without impacting other editors. If you go to the preferences of EMF Compare you will find a page named "Item providers". In this page, you will find all item providers that have been directly contributed to EMF Compare. Some elements are displayed in grayed meaning that can not be disabled. In our example you can see that "Notation item provider" is grayed. Indeed disabling it would produce incomprehensible results in EMF Compare UI on diagram comparisons. That's why its provider decided to prevents user from disabling it. All other elements can be enabled/disabled using the checkbox on the left of each label. For example the two other item providers can be disabled. If you want to know what an item provider is for, you can select it and a short description will appear in the "Description" field. For example, if you select "Stereotyped element item provider" you would read "This provider displays stereotyped elements like they were a new kind of UML element (it uses stereotype's icon and custom label)". This one can be disabled since without it a comparison result in EMF Compare UI would still be understandable for a user. EMF Compare does not act simply on the selected files, but on their whole logical model (a given model can be split through multiple files through EMF control action). Thanks to that, if you try and compare a model file that reference other model files, the comparison will still be able to take these "other" files into account. 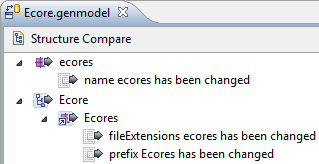 For example, if you try and compare a genmodel file (that depends on its underlying ecore file), then both files will be taken into account for the comparison. For more details about the logical model, please visit the Logical model page. 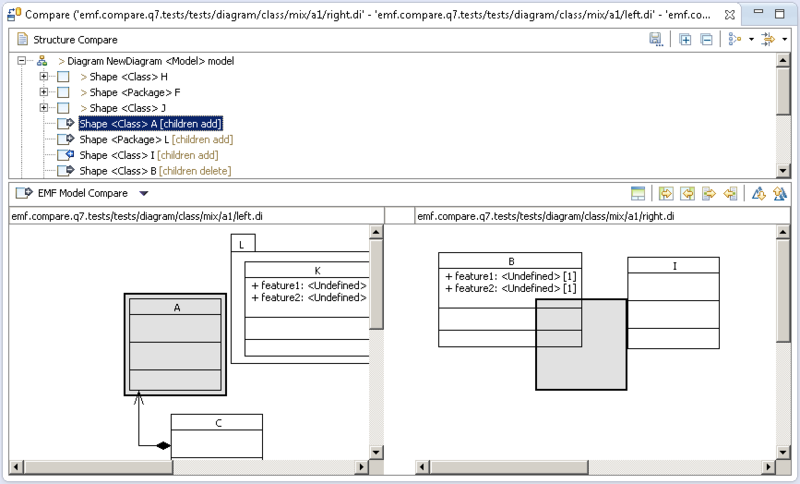 The EMF compare Logical Model View allows to see, for a given model (or set of models), the resulting logical model computed by EMF Compare. 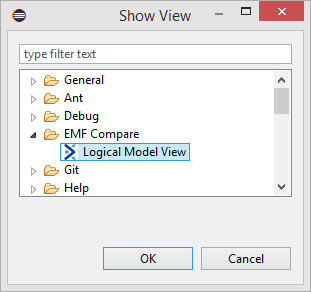 The view is accessible from Window > Show View > Other ... > EMF Compare > Logical Model View. 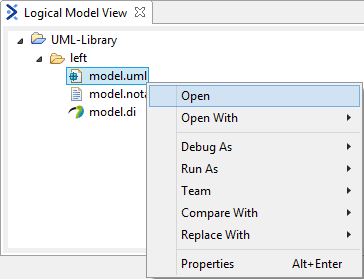 When you click on a model in the Package Explorer view or the Project Explorer view, or the focus is on an opened model editor, then the Logical Model view shows this model and all models linked with this one. While computing the logical model for a given model, the view shows the progression of computing. 1. 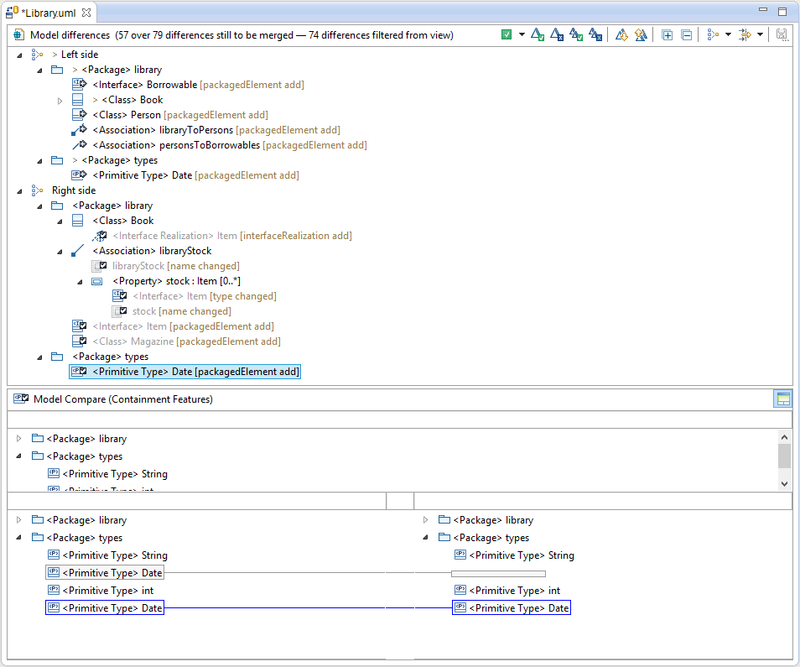 The button Link with Editor and Selection synchronize the Logical Model View to the active editor or the selected element in the Package Explorer View. 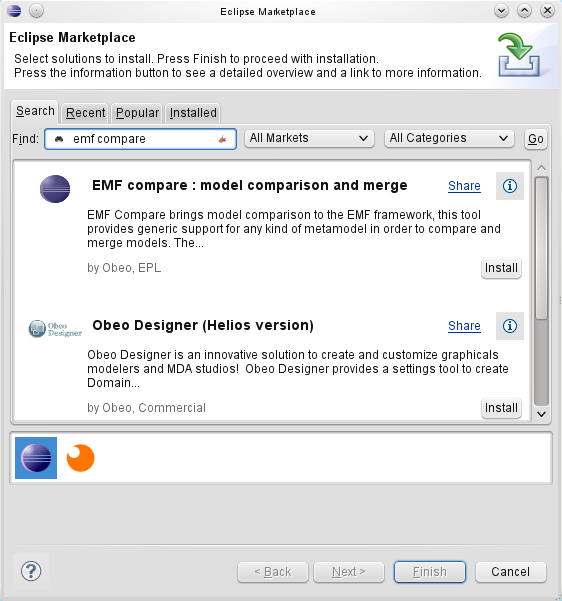 The editors taken into account to populate the View will be: EMF Compare's comparison models editor, Papyrus editors, and EMF Reflective Model editors. Any EMF model selected in the Package Explorer View will populate the View. This button will be disabled by default. 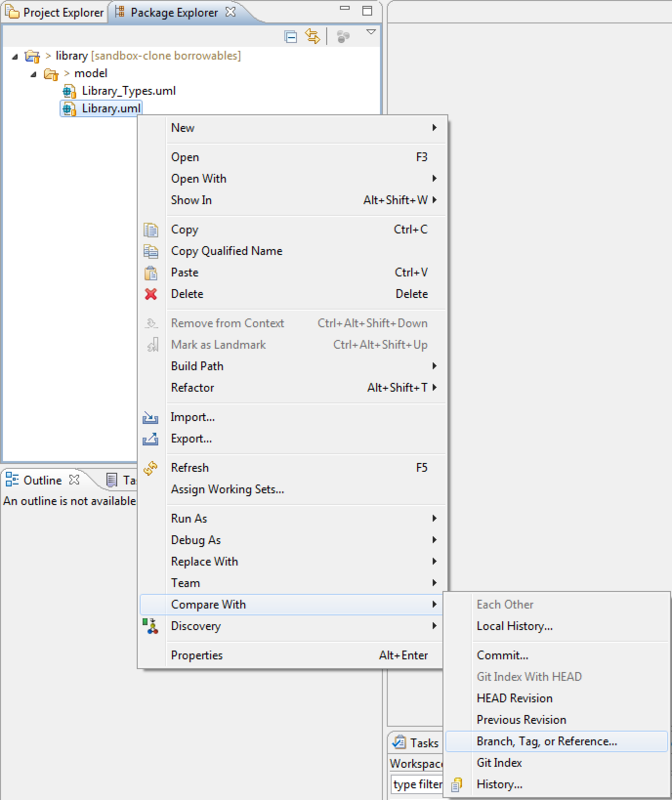 When the Logical Model View is opened for the first time, the button is disabled, and no model is displayed in the view, even if one is selected in the Package/Project Explorer View or the active editor. When the button is enabled, the synchronization becomes active. When the button is disabled, the synchronization becomes inactive. 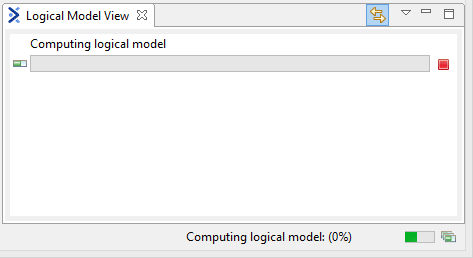 The last logical model computed and displayed in the View will remains until the button was enabled again and a new editor be active or a model was selected, or else the View was closed. Flat list presentation: all models contained in the logical model are displayed as a flat list. Each item is followed by his relative path to the workspace. 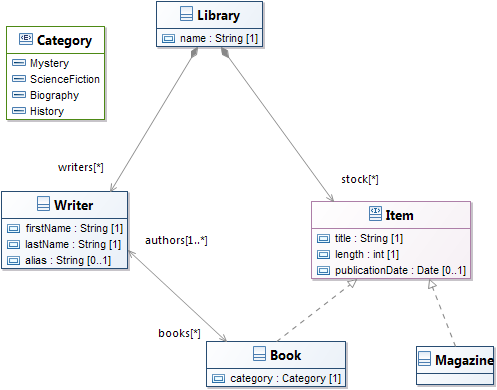 Tree presentation: all models contained in the logical model are displayed as a tree, relative to the workspace.